To be perfectly honest, before taking this Social Media class, I wasn’t aware of all these different blogging techniques and practices, especially how powerful tweeting can essentially be. 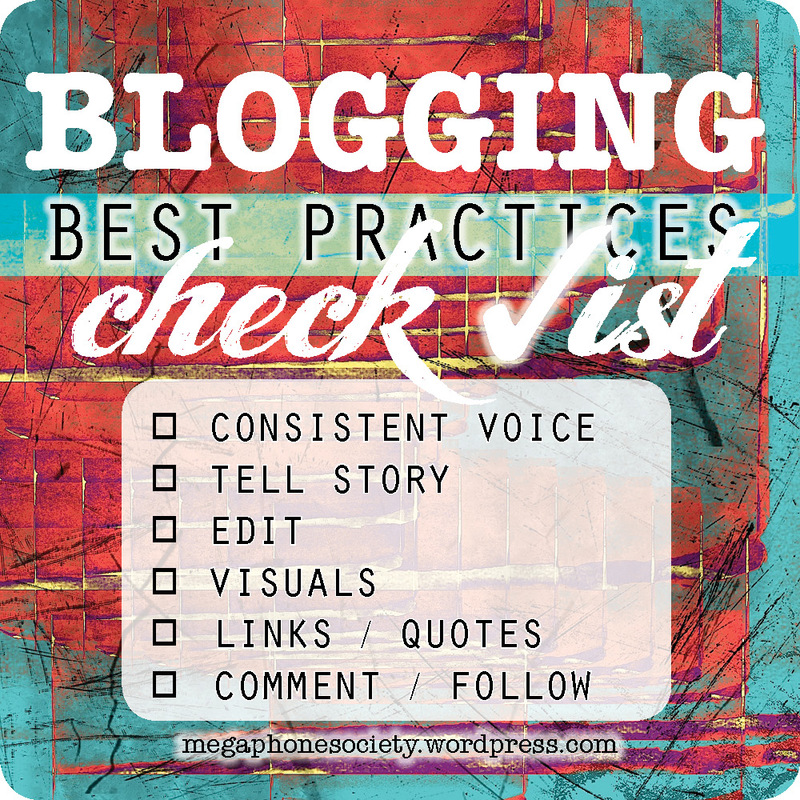 If one wants to be a successful blogger, there are simple practices that should be followed. You don’t necessarily have to follow these practices to the T but they are great ways to improve your style and accumulate more traffic to your social media platforms. The most important aspect of any blog or tweeting is to keep the reader entertained. You need to grab people’s attention by creating tweets that are exciting, relevant, and help to engage with your followers. If you constantly blog and say the same things over and over, your followers will lose interest and look elsewhere. You essentially want to bring your audience back for more and have people constantly writing comments and/or retweeting your material. When you do notice that your material is being shared by your followers, make it a point to thank them and engage in conversation within their post. 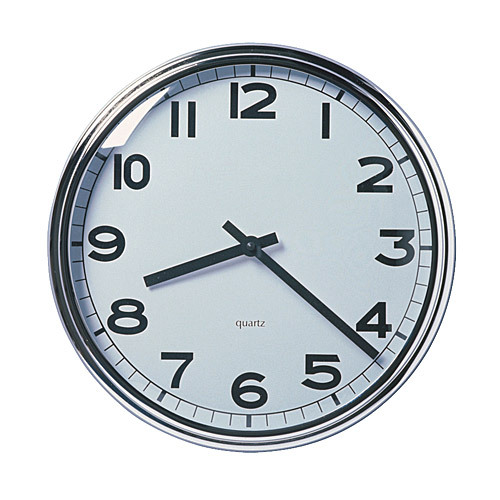 Second, you should post to social media on a regular schedule and at the right times. I do understand that people have full-time jobs and can’t necessary blog or tweet on a regular schedule every day, but you should be prepared. In the sport industry, most athletes aren’t allowed to tweet or blog right before, during, and after a game so obviously those times are off limits. But taken this into consideration, this leaves a period of time that qualifies as their regular schedule because they aren’t participation in a game or practice. According to the blog When to Tweet, Blog, Update Status: Social Media Best Practices, the most popular times to be retweeted are between 2pm-5pm and on Fridays and Saturdays, so tweet late in the day and late in the week. As mentioned in the text book The Tao of Twitter, the author makes it’s a point to tweet twice a day and to have them be meaningful. When it comes to Facebook, weekends are best for sharing because of down time and the site being blocked on most of the consumer’s work computers. Lastly, you should incorporate the author’s pictures so your followers can connect more to what is being discussed. 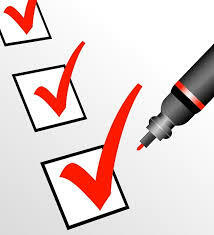 The article, 10 Business Blogging Best Practice, does a great job of discussing this practice. A possible reason to why blogs are created is it creates a sense of a human interaction between each other. If the blog is written by an athlete, it is good to see actual pictures of him/her because it builds a relationship between them and the audience. 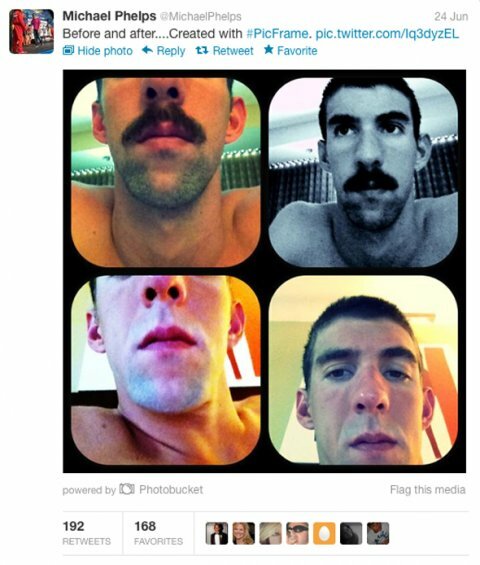 Michael Phelps displayed before and after pictures of himself when he grew a mustache. 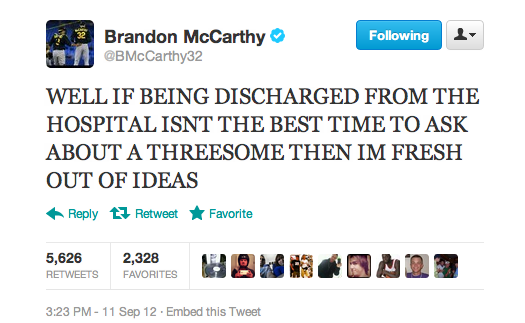 Sure this made people laugh, but it also showed a relationship that he was sharing with his followers on Twitter. At the end of the day, if you follow these three simple guidelines and practices, blogging/tweeting will be an enjoyable time. Be respectable of everyone and treat others like the way you would like to be treated in return. Keep the reader entertained, tweet and blog on the regular, and show human interaction to your followers. The sport industry has no problem exhibiting this because of all the athletes that are obsessed with social media! To decide to take your brand social is a no brainer. If you ask me, the companies who aren’t involved with the social media world are falling behind their competition. 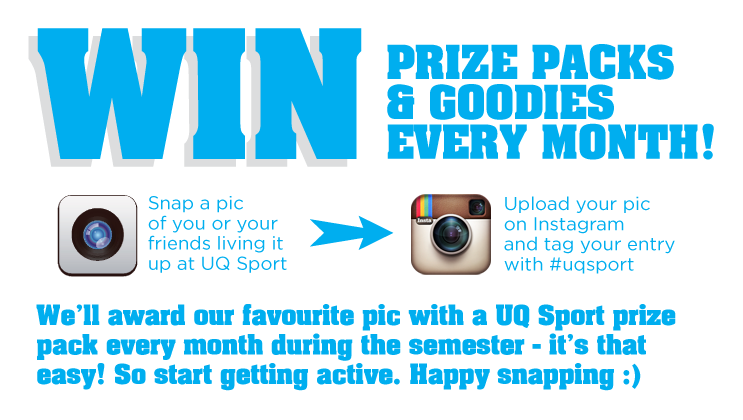 The sporting industry thrives within social media because it builds a closer relationship with the fans. Organizations and teams use social media to keep the consumers aware of their product and service. Athletes use social media outlets like Twitter to help boast their popularity and be loved by their fans. But with social media comes challenges and risks. 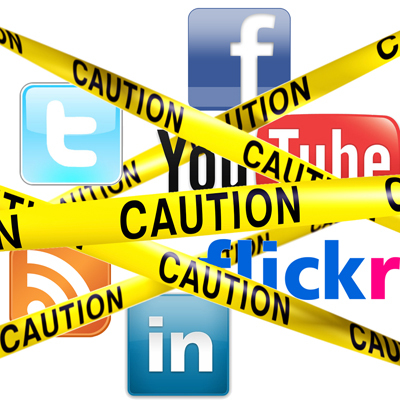 At the end of the day, I strongly believe the advantages of taking the brand social outweighs the risks. Let me first start at the benefits of social media marketing their brand. In today’s society, you can’t go throughout a day without hearing or seeing some form of social media. When you are watching Sportscenter, ESPN always shows tweets from athletes in response to an event that occurred in the sporting world. When you go to sporting stadiums, advertisements are displayed directing you to go to social media pages like Facebook to enter to win a prize. Major challenges with social media within sports usually fall on the athletes. I can’t even count the times that an athlete tweeted out a derogatory message in the heat of the moment. In most instances, these tweets are deleted by the user immediately because of the backlash it has resulted in. But as everyone knows, nothing can really be deleted from social media because people document and save these messages and pictures. Take the Buffalo Bills football player Stevie Johnson as an example. After dropping a game ending touchdown catch that caused his team a loss, he expressed his feelings on Twitter after the game. “”I PRAISE YOU 24/7!!!!!! AND THIS HOW YOU DO ME!!!!! YOU EXPECT ME TO LEARN FROM THIS??? HOW???!!! ILL NEVER FORGET THIS!! EVER!!! 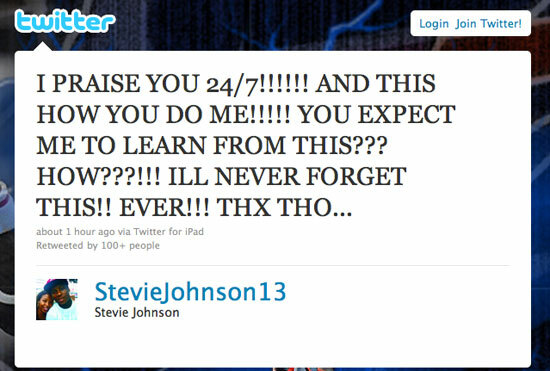 THX THO…” Obviously Stevie Johnson didn’t truly mean what he said but it was in the heat of the moment and he can never take that tweet back. This is a major challenge that comes with the use of social media. The risk of athletes hurting their image and the team’s image by posted distastefully messages on social media. A way around this would be for the teams to enforce a rule that players can’t operate a twitter account or any other social media outlet without the consent of ownership. This would allow for athletes not to damage their reputation as well as the organizations. 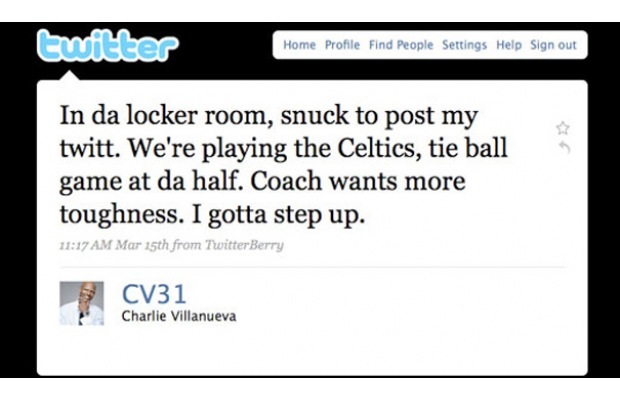 Another instance took place a few years ago by Charlie Villanueva, who was on the Detroit Pistons at the time. In the NBA, and other sports, there is a rule that both players and coaches cannot tweet before, during, or after a game until all press meetings are finished. Well wouldn’t you know, before this rule went into effect, Villanueva tweeted during halftime of a game that essential got him in trouble with his coaches and fans. All he wrote was, ““In da locker room, snuck to post my twitt. We’re playing the Celtics, tie ball game at da half. Coach wants more toughness. I gotta step up.” He knew he wouldn’t get any serious punishment but he went behind everyone’s back and showed no respect. This shed a negative light on the Pistons because it made it seem like the team doesn’t have people in place to prevent this from happening. Overall, the sport industry does have its challenges when dealing with it athletes but that is bound to happen in any industry. Taking the brand social would only help make sports more profitable because its name is getting out to the consumer and they are getting connected with the athletes. I am not going to sit here and say there aren’t many challenges with taking your brand social but where aren’t there challenges in life? The sport industry is doing it right by incorporating as much of their product and services into social media. Welcome to my 3rd blog in the past three weeks! I am getting more and more comfortable as each week passes and I look forward to hearing everyone’s feedback (both positive and negative). Mobile social media application in the sports industry will be the topic this week and I will talk about how this drives business services and products to consumers and also other businesses. Let’s face the facts, mobile communication has rapidly become the preferred method of interacting to people and all aspects of social media. Who can honestly say that they don’t use a smart phone on a daily basis? The sport industry understands this and has made the appropriate steps to incorporate these mobile applications in the way they do business. The Amplefuture Group is a market leader in mobile social media that creates innovative mobile solutions from iPhone and Android apps to live mobile video streaming that provide marketers with powerful new ways to reach mobile users. If you’re a fan who wants up-to-date and accurate information about the big game, Amplefuture is the place to go. Amplefuture has been in partnership with a variety of sports organizations to design pay-per-view services for fans, such as our mobile application designed to stream live boxing matches to viewers. For example, if you’re a big baseball fan, there is an app that delivers all the scores directly to the consumer’s mobile phone. 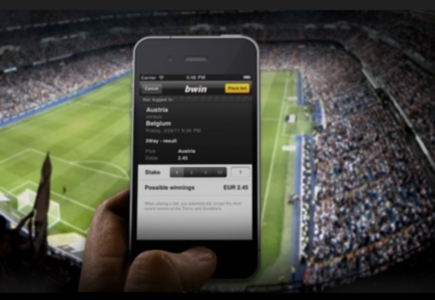 This app that combines mobile, web and payment services means that all sport supporters can stay in touch with the action wherever they go. As stated directly on their website, “Amplefuture is the first choice for sports media rights owners seeking the most effective way to communicate with fans” (Amplefuture, 2010). If you are a sports fanatic like me, you must love Sunday’s during Football season for two reasons: watching as much games as possible and to compete in Fantasy Football. Fantasy sports have given a huge boost in ratings for all sports in general because it gives another reason for consumers to follow their favorite players by watching more games and purchasing memorabilia. 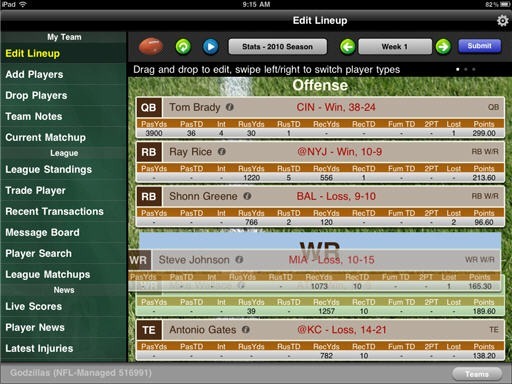 There are all different mobile apps out there but the one that I think has the best mobile use is Yahoo Fantasy Football. The success that these applications have had on the industry of sports in tremendous. In the example of Fantasy Sports and the apps that come with it, a sense of breathe air has consumed the world of sports and has made it interesting again to watch. If you ask me, these mobile applications has revived the sport industry in a way that consumers are constantly checking their phones for the latest social media applications. Success in mobile social media applications only means a greater success in the sport industry! Social media has done wonders for the sporting industry and will continue to do so moving forward. 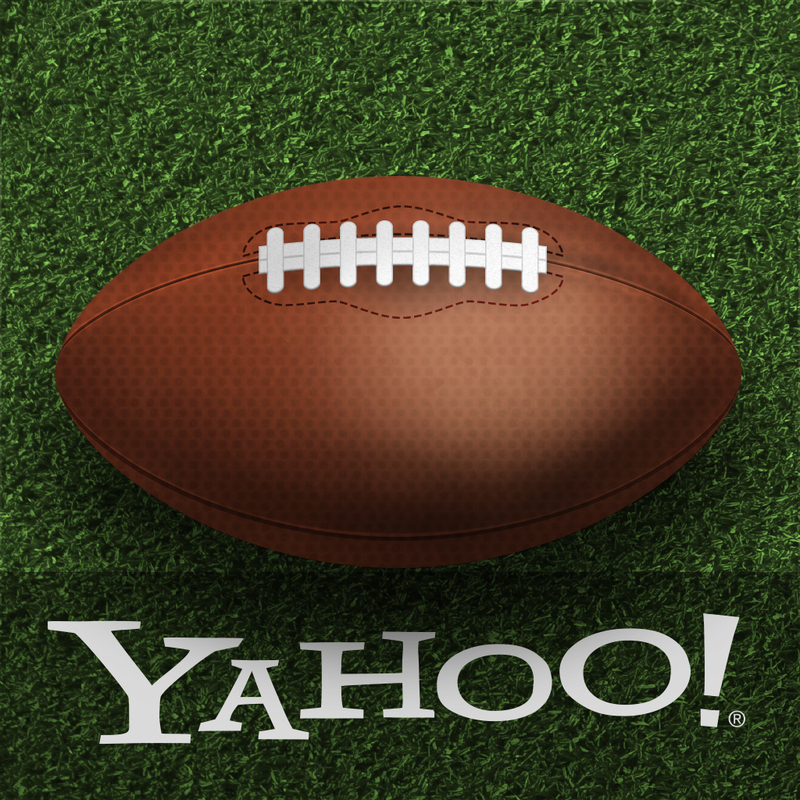 The world of Fantasy Sports is a big reason why sports have become so popular to watch. This has been a proven effective tool that enhances fan interaction, ticket sales, and television ratings. When it comes down to it, sports are a big part of people’s lives and the industry understands that. More and more sporting teams have adopted the way social media is handled within their organization. Take for example the Major League Baseball team the Cleveland Indians. The Indians wanted to contribute to social media around the team rather than just be spectators. 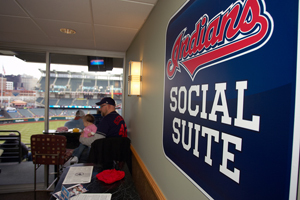 The organization opened a Social Media Deck in the bleachers of their stadium Progressive Field, creating an experience where bloggers and other active social media participants can sit acting as their own press box. This section is sponsored by Time Warner Cable and has wireless internet access as has since expanded into a luxury suite. This whole social media experience has continued to increase ticket sales and attendance with a waiting list of over two hundred people! The NBA is probably one of the sturdiest social media positions within the sports industry mainly because of the Twitter and Facebook following of more than twenty plus million people. The National Basketball Association constantly uses social media strategies each and every day, which is mainly experienced through the players themselves. As mentioned in the article 20 Great uses of social media in sports no other property has as many of its highest profile superstars frequently tweeting and posting on Facebook as the NBA. The player that has used social media to the fullest would be Paul Pierce, no longer a Boston Celtic but not a Brookline Net. Last season, he sent out a tweet saying to meet him in twenty minutes at a location of his choice if someone wanted two free tickets to the basketball game that night! It was a local news headline and I thought it was great publicity for Twitter. The NBA legend Shaquille O’Neal was one of the first well-known superstar to really introduce this website by announcing his retirement through this start-up, real-time video messaging service. Tout saw a great opportunity with the legend Shaquille O’Neal and used each other to boost awareness in the social media world of breaking news. 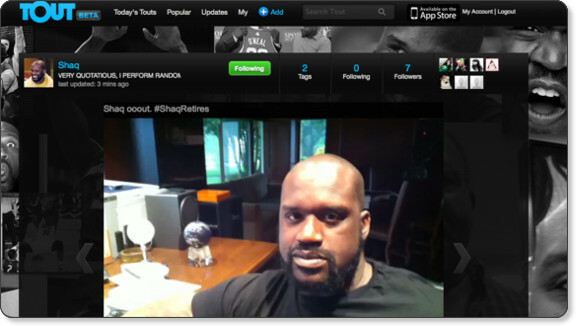 Shaq’s fifteen second retirement video on Tout.com gained more than 500,000 views in the first three hours after it was posted. This is just a great example of a social media tool that is used in the sports industry. In combination with Tout, Twitter and Facebook; the sports industry should continue to use these platforms and additional tools to improve their standing within the social media environment. I first want to thank you for checking out my first ever blog written through any form social media and I am eager to hear people’s feedback! The topic of this week is tools used in social media. This is a fitting topic because I find myself to be on sites like Facebook, Twitter and Instagram on a daily basis but just to post pictures and be snoopy (Don’t lie, you do it too!). Social Media is surrounded by us constantly without us even realizing it. Social Media embraces both web and mobile based technologies that help lend a hand to shared information through communication between businesses, societies and individuals. The article 10 Best Social Media Management Tools gave me a better understanding of the tools used in social media. Tools such as HootSuite & SocialFlow were the two that really stuck out to me because I have actually used both before. HootSuite I would expect for people to have at least heard of but I can’t say the same for SocialFlow. HootSuite is the more common social media tool of the two and is made for people and businesses to connect across multiple social networks such as Facebook, Twitter and LinkedIn. If you have many social media accounts and want to manage them better, this is the tool for you. HootSuite organizes all your accounts in customizable tabs where you can keep track of all your feeds at an easier and faster rate. What’s even better is HootSuite can be purchased for the price of $0! That’s right you heard me, for free! 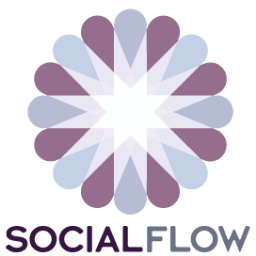 In addition to HootSuite, another tool used in social media is called SocialFlow. SocialFlow is used to watch live conversations on social media to help forecast the best times for distributing content during the best possible time where your target audience will be present. What a genius idea right? In addition to reaching your target audience, SocialFlow also conducts an analysis of social signals to help identify where people should spend money on supported tweets and posts. If you had to make a decision on only and you can’t decide, I will make it easier for you; choose both! HootSuite and SocialFlow have joined together to bring HootSuite users the options to connect their SocialFlow account straight to their HootSuite social media management system. This new venture provides fast and easy access between both accounts on essential one dashboard. The purpose of using both HootSuite and SocialFlow is to improve all decisions in regards to publishing to the particular target audience that you want to reach. I hope I passed my first test of writing a somewhat interesting blog and a topic that I believe I know a great deal about. For the people who did enjoy reading my blog and want to leave any comments or even concerns, please feel free! I look forward to the next few months where I become more comfortable typing my life away and sharing my thoughts to the world to see!